Our triple-beam interferometers combine three interferometers into a single unit and thus are capable of making simultaneous, nanometer-precision, triaxial length measurements. They are intended for incorporation into customer supplied systems. Angles may be determined with high precisions from the differences between pairs of length measurements and the respective beam separations involved. The dynamic ranges for pitch and yaw measurements are approximately two minutes of arc. A HeNe laser emitting an ultrastable wavelength supplies all three interferometers so that all three length measurements will be based on the same reference length. 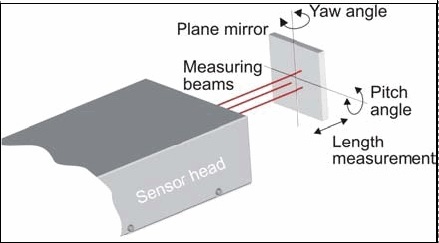 A single fiberoptic lightguide conducts its output beam to the interferometric sensor head. Motions of the moving mirrors are converted into modulated signals that are transmitted to an electronic power supply/ signal processing unit. A HeNe laser serves as the light source for the miniature interferometer and is frequency stabilized on models with large dynamic ranges. Compensation of environmental influences form the basis for high metric precisions and are achieved through the correction of laser wavelengths. A PC running a custom software package is employed for operating the electronic modules and displaying measurement results.